Ooh love it we went to a place in the Wye valley with similar figures. They look great amongst the trees don't they? Yes - though a little scary. My son thought it was some sort of apparition! Thanks! It turned out better than I hoped! 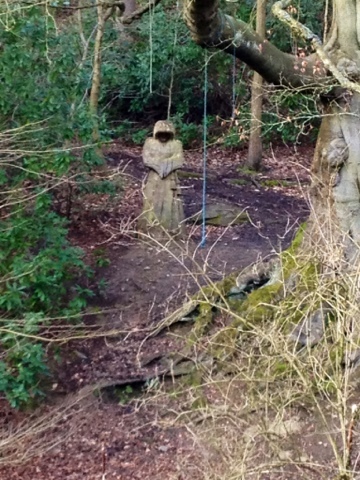 It's a statue of a Druid. The park is called st Ives estate in Yorkshire and its the setting for an ancient Druid alter of human sacrifice! Scattered round the park are various statues of Druids, dragons etc. I've never noticed this one before as its set so heavily in the undergrowth. I love that - its looks really ghostly! Yes, wonder I'd it's s ghost of one of the poor sacrifices! Yes, we call it the Gruffalo forest, it's pretty eerie. That's pretty creepy, great shot. That would freak me out! Looks great though. Now that's quite eerie but a great pic! I also thought it looked like a ghost like your son. I might go back at night and scare myself...WHHHOOOOOO!